The William Haggas-trained SEA OF CLASS, bought at the Tattersalls December Yearling Sale, won the Group 1 Irish Oaks at just her fourth start under a confident ride from jockey James Doyle. The daughter of SEA THE STARS is owned by the Tsui family’s Sunderland Holdings who bred and raced her Prix de l’Arc de Triomphe, Derby and 2,000 Guineas winning sire, as well as his dam URBAN SEA who also won the ‘Arc’. SEA OF CLASS is out of the Italian Listed winning HERNANDO mare HOLY MOON whose seven black type performing progeny include the Group 1 Prix Lydia Tesio and Group 2 Italia Oaks winners CHARITY LINE and FINAL SCORE. She was bred by Razza Del Velino Srl who offered her for sale at the Tattersalls December Yearling Sale, where she was consigned by Old Buckenham Stud. SEA OF CLASS was purchased on behalf of her owners for 170,000 guineas by McKeever Bloodstock. 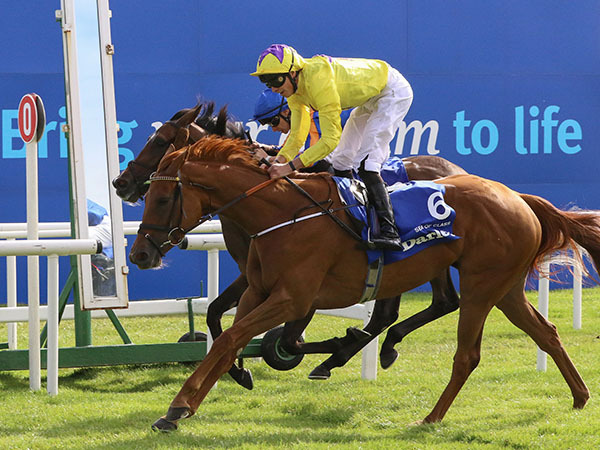 SEA OF CLASS is the second Classic winning Tattersalls yearling this year following the Group 1 Irish Derby victory of LATROBE who was purchased at Book 1 of the Tattersalls October Yearling Sale for 65,000 guineas. The next sale at Tattersalls is Book 1 of the Tattersalls October Yearling Sale which will feature a significant number of yearlings by SEA THE STARS as well as the OASIS DREAM half-brother to SEA OF CLASS. It takes place from October 9 – 11.